I’ve used Apollo for months and tried the official app. Comparing this app to Apollo is sort of like comparing Apollo to the official app. There’s simply no competition. 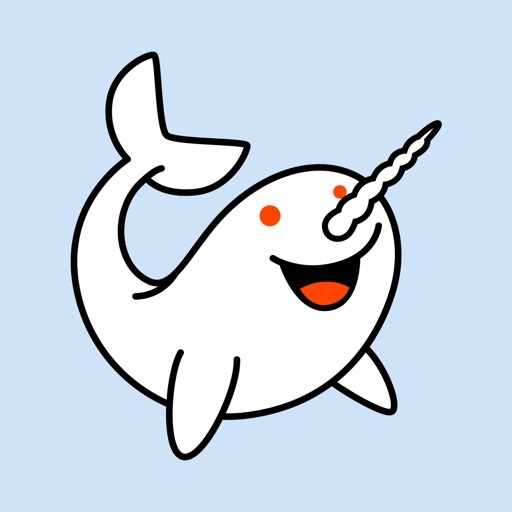 Despite occasional crashing, Narwhal remains the easiest to use and cleanest Reddit client on the App Store. Highly recommended. Other than the last update broke my ability to browse reddit and listen to music simultaneously, and that's become a bit of a deal breaker at the moment. The only Patreon I support because these guys are amazing. Most used app on my phone. Hey Narwhal devs, it’s really annoying when you’re deep in a thread and have to put your phone down for a minute or check another app, and when you return 10 minutes later, you’re back on the home screen. This is stupid. You should save the state before the app closes so I don’t lose my place. I love this app but a recent add for "Pearls" (some kind of produce company) appears full screen as if I clicked on it every time it loads at the bottom of the page. This is incredibly frustrating. This is my go-to reddit app but until this is fixed I'll be using something else. I used to love this app so much. It did everything I wanted it to do. The $4 required to get rid of ads is more than fair as well, considering how much I use the app. However, when loading images, it freezes for around 30 seconds each time on my iPad Pro 10.5, which is the most powerful iPad on the market right now. There is no reason for anything on it to lag. I hope the devs release an update for it, because this is the best way to experience reddit so far that I have found! Wow ! Best reddit app. Wow guys you nailed it ! I've tried many Reddit apps and yours takes the cake. I love the intuitive UI, upvoting, saving, viewing images and getting back to the main thread are so easy. Dark mode where have you been all my life ? Multi-Reddit's yes please. Get the best reddit app and you won't be disappointed. The dev has been incredible. Pay for ad free and this app cannot be beat.